Barnabas and Saul arrive at Paphos they are challenged by a “sorcerer and false prophet” named Bar-Jesus, or Bar-Joshua. Bar-Jesus was a counselor for Sergius Paulus, the Roman proconsul on Cyprus. Thus Bar-Jesus was a very powerful man in the government His name means “son of the Savior,” but he is also known as Elymas, meaning “Wise” in Arabic. 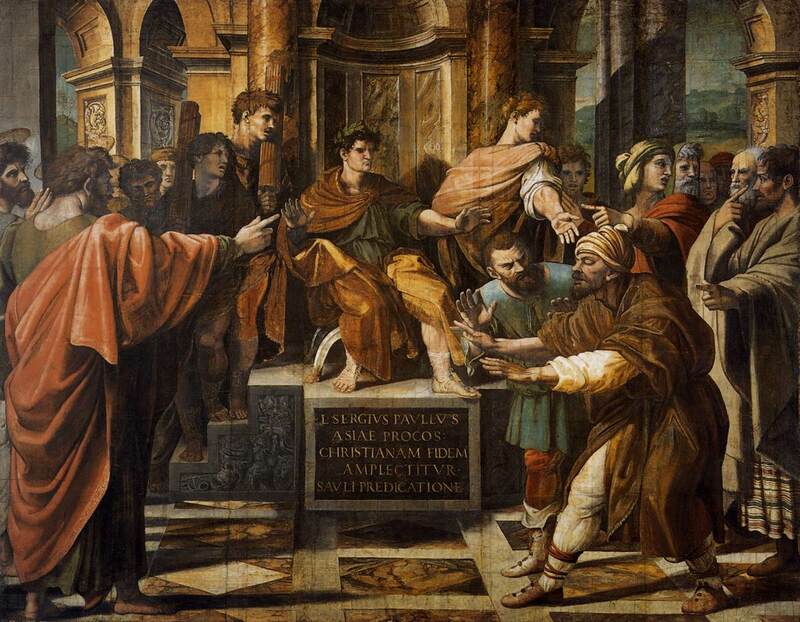 Sergius Paulus wishes to meet with Saul, but Bar-Jesus opposes this meeting. Paul is described as “full of the Spirit” as he condemns Bar-Jesus. Paul accuses him of trickery and deceit, and perverting the ways of the Lord. Paul then blinds the man, and he had to be led away. This is in itself a rather unique event in the New Testament, but the miracle is also a symbolic act. There are a number of miracles in the New Testament which are more or less “prophetic acts.” Jesus heals a blind man in Mark 8:22-26 who begins to see, then sees fully. This is a picture of the understanding of the disciples at that point in the gospel of Mark. The result is that the Gentile man who is not a God-Fearer believed and was amazed at the teaching about the Lord. Luke uses the blinding of Bar-Jesus at this point in Acts to signal a major shift to Gentile mission. Luke begins to refer to Saul and Paul. The change occurs in the middle of the conflict with Bar-Jesus. Saul was always also known as Paul, but it is at this critical part of the story when Luke chooses to begin using the Roman name in his narrative. This is a hint of a major shift in the progress of salvation history, from the Jews to the Gentiles. Luke also switches the order of the names from this point on in the book. Until this prophetic judgment speech, “Barnabas and Saul” traveled together, now “Paul and Barnabas” travel on to Antioch. The only exception is at the Jerusalem council in Acts 15, likely because Barnabas took the lead in speaking with James. On a literary level, Paul is the main human character for the rest of the book. The blinding of Bar-Jesus is the literary and theological transition point in the whole book of Acts. Paul and Bar-Jesus are in many ways similar: both were blind and both encounter the truth of the Gospel of Jesus. Craig Keener points out at least five clear parallels between Paul and Elymas (2:2009). Both twisted the way of the Lord and were struck blind as a result. But Saul was Pharisee who kept the Law with a clear conscience, Bar-Jesus is “sorcerer” working for a Roman official. While he condemns Elymas for his twisting the way of the Lord, Paul is also symbolically condemning all of the Jews who have resisted the Holy Spirit. Many commentators find the name “Bar-Jesus” ironic, since Elymas is not a “son of Jesus” but rather a “son of the devil” (v. 10). Jesus used the same verb “twist” (διαστρέφω) in Luke 9:41, a clear literary parallel in Luke/Acts as a whole. After declaring the present generation to be “faithless and twisted,” Jesus immediately predicts his own execution, (9:42-45) and then “resolutely sets out to Jerusalem” (Luke 9:51). Virtually everyone recognizes 9:51 as a major transition in Luke, a similar transition occurs in Acts 13. It is critical observe Bar-Jesus is blind only for a time, not permanently. So too, Israel is only set aside in the progress of salvation, they are not “cut off forever.” If this is a symbolic miracle indicating that the Jews are “blinded” to the gospel, it also promises a restoration of the Jewish people in the future. What other indications in Acts 13 would support the suggestion Luke is using the blinding of Elymas as a literary and/or theological transition in the book? ← Acts 13:4 – Why Cyprus? I would agree with this blog post in that Elymas’ blinding is used as an example for believers to see. Paul tells later in Chapter 13 how God’s people throughout Christ’s ministry people were blind to his mission (Acts 13:27). Paul also uses many prophecies from the Old Testament to support his words. Referring to the Old Testament prophecies shows there was a theological blindness that is now being fulfilled. Farther in Acts 13 Paul alludes to Isaiah 49:6 where it tells prophecies the disciples being a light to the Gentiles. I would support that Elymas being shamed is an illustration to the Jews that they should all be shamed for resisting Christ and the power of the Holy Spirit. Further within Acts 13, there is deeper support in why Luke writes and eludes to the blinding of Elymas or Bara-Jesus as a conversion of significance within Acts. Both Elymas and Paul had an encounter with Christ and the message of is mission. The result is similar in regard to Paul’s story in a temporary period of time without sight. In my understanding, I perceive that like Elymas Israel has strayed from the straight path that God gives light to the Gentiles and those who seek his Name. At this transition of the book, the redemption is a choice to all nations, not just Israel, this structure shifts the paradigm of Gentiles and Jew believing Christians finding one thing in common and that being Christ. Overall, Acts 13 with Luke’s perspective is that without God we are blind to the wonders and life that he gives and presents to us. When God opens our eyes to what he desires of us to be or become we decide to see the larger picture of God’s plan working through us to reach others. That is interesting perception on this story. While it does make sense, Israel would stray, go against God, discipline would incur, then Israel comes back. This is a common theme. Why would God not do this with others individually? Redemption is a choice for everybody, and it is offered to all and many Jews find it hard to accept that Gentiles can now worship with them. I think that God uses the blindness of someone to show deepen their faith because if you cannot see you have to have faith in a lot of things, and having that faith in God makes so much of that easier. I think for Israel, when they were “blinded” they needed to strengthen their faith and like all of the stories of Jesus healing blind individuals, God will also restore Israel. This reminds me of the hardening of Pharaohs heart in Exodus 7. God gave him multiple chances to see past his own desires and choose the correct path, but when he failed he suffered the consequences. As humans we seem to need physical reminders and proof of our faith and the significant role it plays in our daily lives. Looking back to Exodus once again, I am reminded of the plagues that swept over Egypt as the result of Pharaoh’s decision. Something interesting in Acts 13:12 was how the proconsul believed because of the blinding of Bar-Jesus. I think this could show a theological transition in that the Jews had their chance to accept the gospel and their ignorance allowed for the Gentiles to experience the Holy Spirit. It is interesting the wide effects the temporary blinding had on Bar-Jesus, not only would it be inconvenient to lose sight but it also would have affected his employment as an astrologer for the Roman governor (Long 74). This goes to show how one mans actions affect his life in more than just the immediate circumstances. I have always understood the power of the meaning behind Saul’s conversion, he went from darkness to light, from wanting to kill or imprison those who followed Jesus, to being one of the most influential people to share the Gospel. However, getting to see multiple stories of the power and representation of blindness really captured the picture of what is trying to be portrayed. The symbolism of how we live in darkness, but through the power of Christ are brought into the light. The other powerful symbol that is seen in the instance of the blinding of Bar-Jesus is the fact that this is the time that the author of the book of Acts uses to transition Saul to the name Paul. This again is representing a life transformation for him. He is no longer going to be feared as Saul, but will be known as Paul, the one who is to share the Gospel to the Gentiles. In both Saul’s and Bar-Jesus’ instance there is a transition from the twisted ways of the world to a new understanding of who the Lord is after their blindness is taken away. These representations are also to show Israel that they too will be blinded for a time, or be up to the side, because of their choice to deny the Holy Spirit, so that the Lord’s plan of salvation to the world will still go forward. For this time they will not be able to be included, but there will come a time where they will be able to claim their rightful place as the Lord’s people.